Wendy comes to folk music from a classical direction. Arthur, who has organized and played folk music since… well, a while…comes to music from a more improvisational bent. Wendy and Arthur met through a series of coincidences. Wendy approached Arthur’s Ottawa Folklore Centre to ask them to sponsor her Celtic Rathskallions children’s show. He agreed and, through years of sharing their love of folk music, they formed the duo, Moore & McGregor. 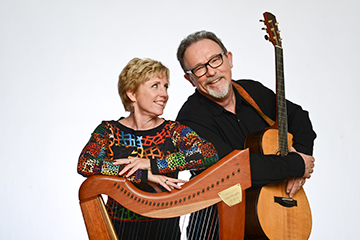 With Arthur’s accomplished guitar, bodhran, banjo and autoharp playing and Wendy’s tasteful whistle, oboe and English horn as well as her Celtic harp playing, this is an evening of old and new, original songs and chestnuts. Wendy Moore is classically trained and played oboe and English horn with the Kingston Symphony for many years. Also experienced in folk music, she created and has managed and led the Celtic Rathskallions, (www.celticrathskallions.ca) her show for school children and families, for over 20 years. Wendy sings, step dances, plays Celtic harp, whistle, oboe, and English horn. She is an award-winning poet and has published two storybooks for children set to music. Arthur McGregor has played and organized folk music for most of his life and is well known as the founder of the Ottawa Folklore Centre. Arthur sings, plays guitar, autoharp, Appalachian dulcimer, bodhran, clawhammer-style banjo, djembe and mandolin. He has been awarded The Unsung Hero Award from the Canadian Folk Music Awards, The Estelle Klein Award (Folkmusic Ontario) and the Helen Verger Award (Ottawa Folk Festival) for his work in the world of folk music.